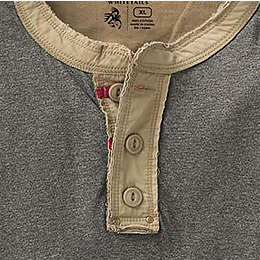 Men's Fully Charged Henley is rated 4.7 out of 5 by 232. 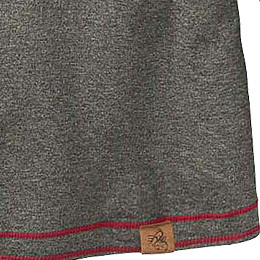 Nothing beats the long-lasting comfort of 100% pure cotton double-faced jersey. 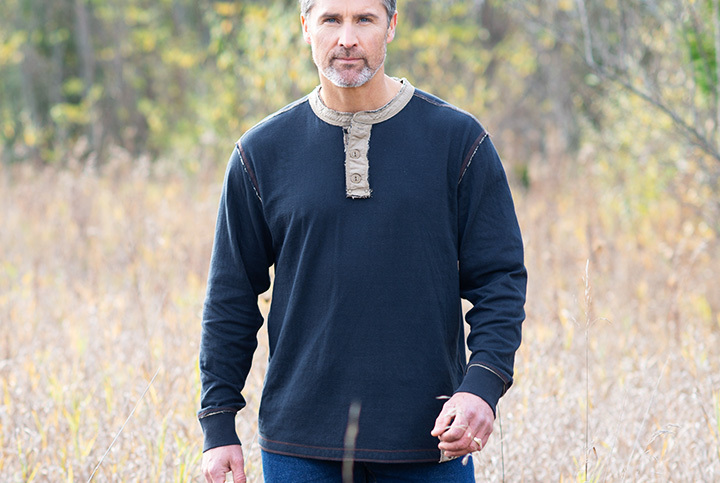 Reinforcements in all the right places so it lasts for years…and just keeps getting softer with each wash.
A henley as rugged as the outdoors. 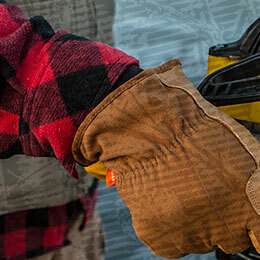 This fabric has a broken-in look and feel for instant comfort and long-lasting wear. 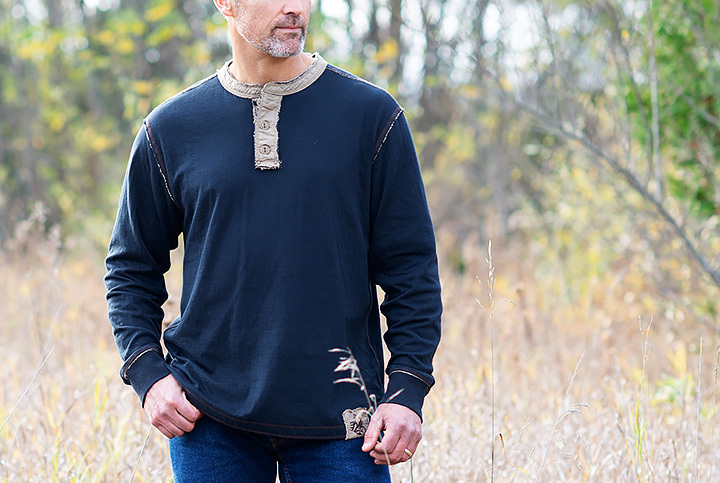 Just like an old favorite, you'll be reaching for this unbelievably soft, 100% pure cotton double-faced jersey Henley every weekend. 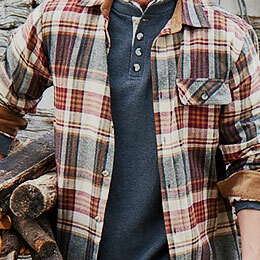 Featuring distressed seams, contrast stitching, and a rugged frayed placket for truly unique character. 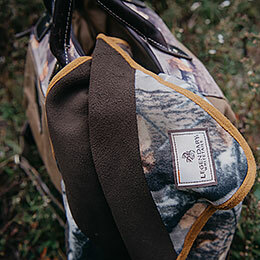 Finished with a vintage wrap-around label on the bottom hem accented with our Signature Buck. Rated 5 out of 5 by TinaR from Love this shirt! High quality, super comfortable and stylish shirt! Rated 2 out of 5 by Steveo from Underwhelmed Not as heavyweight as anticipated. Somewhat disappointed overall. Not worth $45. $20 max. Rated 3 out of 5 by Louisiana Man from Too "Worn" for My Taste This is a very comfortable shirt, but be careful when you look at it online because I found that the picture did not fully convey the degree to which the shirt had a faux worn-in look. At least for me, it was too much and made the shirt look like it was turned inside-out. If that's what you're looking for, great, because the shirt is VERY comfortable. when will you have the orange back in stock in size med. I'm so sorry to say that the Fully Charged Henley has been discontinued and we will not be getting any additional inventory in stock. Why do you advertise this shirt in blue, but when I go to buy it, it's never available? We're very sorry for any confusion. The Navy color Fully Charged Henley sold out incredibly fast this year after being advertised in our past catalogs. 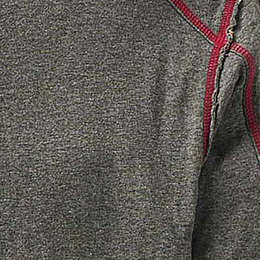 Does the contrast stitching run the length of the arm? The contrast stitching does not run the length of the whole arm. 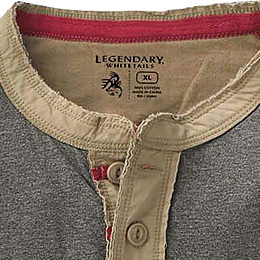 This Henley is designed by Legendary Whitetails in Wisconsin and manufactured in China. Are these shirts regular sizes or are the shirts considered &quot;Big &amp; Tall&quot;?? These shirts (and all out of Men's items) are available in standard sizes Small through 3XL. We offer Tall sizes for sizes Large through 2XL, and they are indicated by a 'T' (i.e. LT, XLT, 2XT). I see these are for big and tall, any regular fit sizes? We offer regular fit sizes Small through 3XL on all of our Men's products. Tall sizes are indicated by a T (i.e. LT, XLT, 2XT). Why do all the shirts indicate &quot;big and tall&quot;? 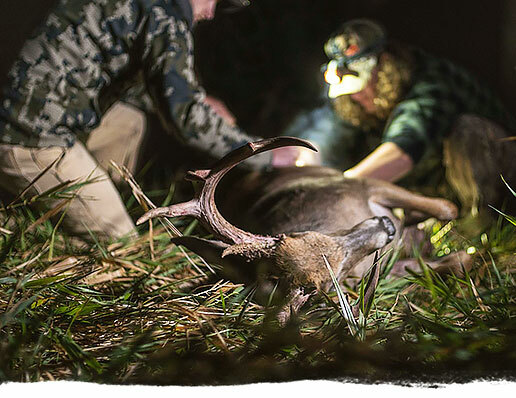 We try our best to offer regular sizing and tall sizing on as many items as we can! Our tall sizing is indicated by the letter &quot;T&quot; found at the end of a size: LT, XLT, 2XT. Our regular sizing does not have a &quot;T&quot; found at the end of the size: SML, MED, LRG, XL, 2XL, 3XL. is it pre washed, will it shrink in cold water hot dryer.. the xl sounds like my size! This item is not pre-washed, so you will definitely want to follow the wash instructions. Machine wash cold, wash dark colors separately gentle cycle. Do not bleach. Tumble dry low. Warm iron if needed.